So what is a good real estate investment? A good real estate investment is any real estate property that increases your net worth through a fair rate of return on your equity. When looking for an investment property, you need to calculate the estimated cash returns on the property for that area to make sure you’ll be getting a good deal. Real estate ownership takes a lot of time and effort. It’s a lot easier to part with time and money on a property you’re fond of. A great way to get your feet wet with real estate investments is to put your personal property up for rent. If you plan to live in a house for a few years before turning it into an investment property, you’ll be better equipped to handle repairs on the house. Living in a property and making changes along the way is a cost-effective, long-term solution for getting started in real estate. You’ll also get better interest rates on the property if it’s your primary residence when you buy it. Fixer uppers are tempting to purchase as a real estate investment because of their lower price point on the market. When looking for a rental property, though, unless you plan to live in the fixer upper first, it’s much more cost-effective simply to buy a solid, reliable home that needs little to no repairs. Things perpetually break down and need repairs in properties, and the home repairs inevitably cost more than you think they will. If you’re looking into real estate investing, make sure you have a fairly sizable cash reserve to cover the expected and unexpected costs of property management and repair. Look for properties in working class areas where rental properties don’t last long on the market. For example, if you live in the city, look for a property that would appeal to young graduate students or young workers. You’re more likely to have your property sit vacant, costing you thousands of dollars if you buy in a neighborhood typically occupied by homeowners. It’s not impossible to rent homes out in nicer neighborhoods, but it’s easier to fill a property with tenants where rental properties have a higher turnaround rate. Keep in mind that expensive homes in sought after areas like the ocean front usually have low cash flow returns. You’d be better off investing in a more moderately priced property with a higher cash return. Don’t buy a property in an area you’re not familiar with. Know the history of the neighborhood, and do your research. Find out how the schools rank, what the crime statistics are, and if there is any noise or air pollution that could affect your ability to rent out the property. Unless you plan on hiring a property manager, take the travel distance into consideration when looking for a real estate investment property. Sometimes you can go months without having to make repairs or visit the property, but other times you’ll be at the property every day that week. It’s a lot easier to manage a property that is close to home. There will always be people looking for a one bedroom apartment. College students, bachelors, widows, and single working class people all usually look for a one bedroom unit, since it’s the most affordable housing option. People don’t like to pay for more house than they need. If you’re looking at getting started with real estate investing, reach out to the experts in your community. Join a real estate investing club and reach out to experts online. Invite a local broker to lunch and pick their brain for ideas on your tab. If you want to be successful with real estate investing, surround yourself with successful real estate investors. 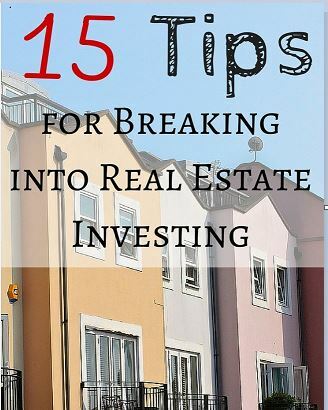 Also, constantly read new real estate books, blogs, and eBooks about smart real estate investing strategies. When you own a property, it’s essential that you hope for the best but plan for the worst. Between expensive repairs and downturns in the market, you need to have a backup plan and money in savings to help cover life’s unexpected financial difficulties. The longer you own the property, the greater your return will be. Don’t hop in and out of property ownership. A little bit of patience goes a long way to increasing your returns. It seems like common sense, but too many real estate investors have gone belly-up with their finances because they relied too heavily on turn around profit or rental streams of income, and then the market took a downturn, leaving them with not enough cash flow to cover their income needs. Until and unless you have enough diversity in your real estate investments to cover downturns in the market or tenants who don’t pay their rent, you’ll need to keep working your day job. Real estate investing can be a rewarding and profitable business endeavor, but it can years for your property or properties to become reliable income streams. Make sure you’re getting a good deal on your investment property and that the property is increasing your net worth. Do the research, know the area, and ask for help from those in your community that have had success. Once you do make a decision on a property, prepare for when things go wrong, and have cash saved to cover the high cost of repairs or expenses. Stay on top of the market, and educate yourself so that you’ll feel more confident with your investment strategy.